1. 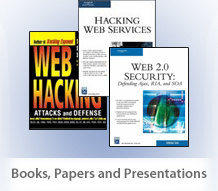 Exploiting Backend – We use different methods (enumeration, tracing, fuzzing etc.) to identify that the lambda function is vulnerable to SQL injection. Once the vulnerability is identified, we inject attacks to exploit the vulnerability and fetch information about the back-end database, its tables etc. In this scenario, we are just leveraging and exploiting the weakness of the lambda function and not touching any other components in the overall infrastructure design. 2. Exploiting AWS Components – We use different methods (enumeration, tracing, fuzzing etc.) to identify the overall architecture and information about the components integrated with serverless functions. Once the vulnerability is identified (for example command injection), we inject payloads to exploit the vulnerability and steal critical information like access keys/tokens/secret etc. 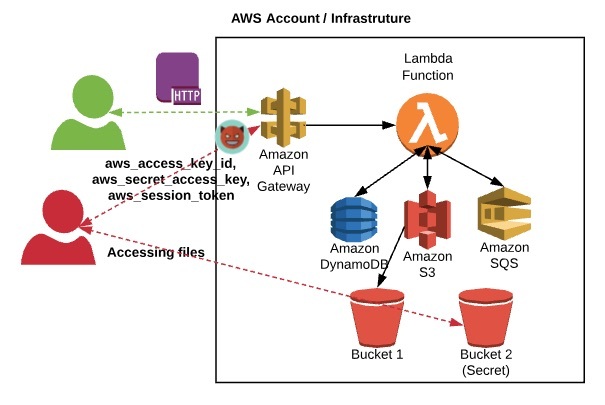 Using this information we can try and access other components like S3 buckets in the serverless infrastructure (assuming that the infrastructure has poor permission controls). We will look at an exploit scenario that would arise by the combination of these two vulnerabilities – injection + poor permission controls. Of course, there can be other areas beyond the ones mentioned above, which can also be exploited through leveraging information leaked from lambda functions. Let’s take a simple use case that we used in a previous blog: - There is an invoice processing system where a user submits an invoice (by uploading a file, providing the file name, other basic information etc.) through an API gateway. Some activities are then triggered across other AWS components like S3 and DynamoDB and the message to queue the invoice processing gets posted to Amazon SQS service for asynchronous processing. It is possible to extract these parameters via vulnerable lambda functions (with and without outbound connections). It is also imperative to understand permission structure of the lambda function within AWS. These three parameters hold a key, which can be considered as a permission token. Whatever permission is assigned to the lambda function is mapped to these tokens "temporarily". The tokens might be valid for few hours, after which they are refreshed – once refreshed, the tokens need to be grabbed again. Bingo! As we can see below, we were able to list all S3 buckets and their content. Why? It seems that the lambda function might have access to all S3 buckets. The above script establishes a connection with the extracted tokens and tries to fetch the file. We are also successful in fetching the file. This file should not be accessible to us but we end up having it. Hence, here we are successful in exploiting the vulnerability due to poor permission controls. 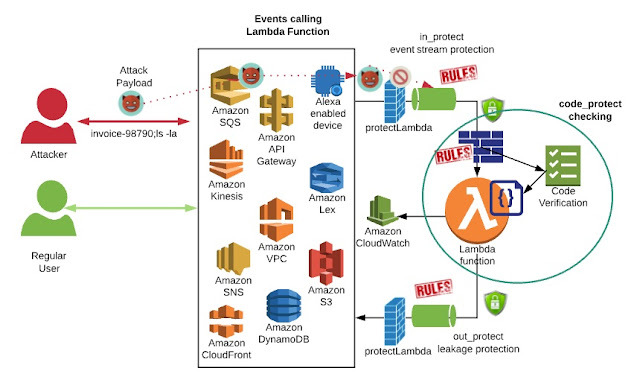 The permission controls implemented for lambda functions may not seem critical while executing the lambda function stand-alone or by looking at the features or from a developer standpoint but it might turn out to be catastrophic for the overall AWS infrastructure because of a combination of vulnerabilities. It would not only lead to a compromise of the lambda function or backend details but would impact the overall application residing on that particular account. Who knows? 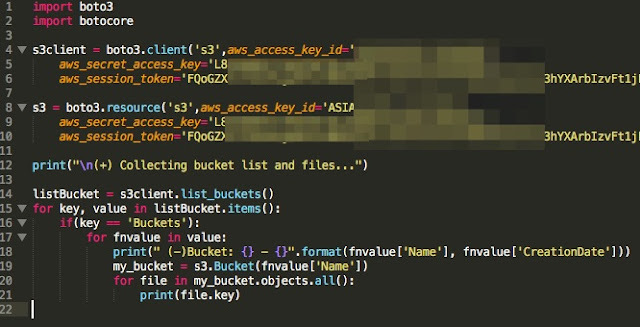 – An attacker may end up getting access to secret buckets, sensitive DynamoDB tables, EC2 backups and files etc. Thus, permission controls should be well implemented across the complete infrastructure and not stand-alone lambda functions. We will cover more on permission structures and issues in the coming blog posts. 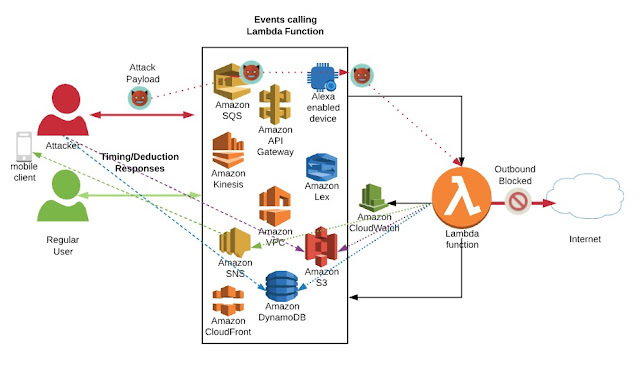 As we have seen earlier, lambda functions, which are integrated in serverless applications, are not usually isolated and consume events from various components like Amazon S3, DynamoDB, SNS etc. as shown in the below figure. In this article, we will look into how an attacker can leverage serverless applications and components integrated to the functions to fetch information and detect vulnerabilities in spite of blocked outbound connections. For this scenario, let's assume that the lambda function is integrated with various Amazon components according to the design pattern of serverless applications. We can enumerate the lambda function and identify which components are integrated with the function (an outbound connection is not required). Once the component is identified, we can use customized payloads according to the component for various use cases and check the results. We have the following code in place – which processes the 'exec' command for fetching 'key3'. We are blindly checking for a command execution vulnerability in this piece of code, where the lambda function does not have any outbound connection. Let’s take different use cases/design patterns for serverless applications and see how it can be leveraged during post exploitation. We can inject the below payload and push environment variables to the known-bucket. We can say that the command is successfully executed if the variables are written and we can read them all (no outbound connection is required). In the same manner as above, we can inject the below payload and check for successful execution of the command if the environment variables are written to the known-and accessible dynamodb (access via some other use case). 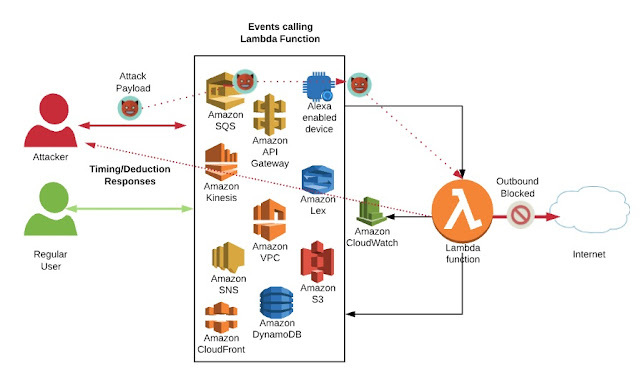 We discussed three use cases in this post, but there might be more since lambda functions need to interact with several components across the AWS eco-system. The best practice to fix vulnerabilities is by resolving the vulnerabilities with secure coding practices and protecting against incoming malicious event streams. "Post-exploitation" solutions end up providing a sense-of-security but are not reliable defense solutions for protecting lambda functions. Here is an example that we covered in an earlier post (here), where we injected a payload in the event stream of the lambda function and harvested the access key using an outbound connection. Now, let's assume that we don't have this outbound connection in place. The lambda function blocks the connection. Not allowing an outbound connection can be considered as obfuscation and sense-of-security in place. It is possible to identify and exploit this type of scenario by considering it as a blind spot. Let’s try a timing attack to identify the spot and logical deduction to exploit the scenario. The above response shows that the time for this execution is Duration: 56.36 ms.
Now let us try to inject simple sleep command and see the variation in response time. Here, we can see that it took almost 1 second more in responding back (Duration: 1123.26 ms). Hence, we can easily deduce that there is a blind spot and go on with playing around this vulnerability. Since we don’t have an outbound connection in place, how we can get hold of the AWS key like we got using curl in previous case? Hence, we need to deploy a deduction technique and try to fetch it with multiple attempts. Here, we are getting first character of the key and comparing it with 'A'. If it matches then we should get a sleep of 1 second else response should take regular time. Let’s pass this message and invoke the function. Bingo! As you can see we actually got a proper delay of 1 second (Duration: 1108.62 ms) in this case. Hence, we can say that the first character of the AWS key is indeed 'A'. In this case response time is far less, approximately 1 second less (Duration: 106.76 ms). Hence, we can conclude that the value of the first character is 'A' and not any other. This way we can send multiple requests and harvest full value of the AWS key without any outbound connection. It is imperative to identify injection points and fix the vulnerabilities at the source rather than relying on deploying "post exploitation" solutions like blocking traffic or other OS level calls. Once a vulnerability is identified, an attacker can always find ways to mount attacks and exploit the identified vulnerability.